This article is about the biologist. For other people named Alexander Fleming, see Alexander Fleming (disambiguation). 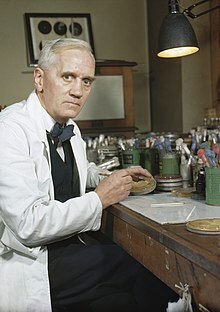 Sir Alexander Fleming FRS FRSE FRCS (6 August 1881 – 11 March 1955) was a Scottish biologist, physician, microbiologist, and pharmacologist. His best-known discoveries are the enzyme lysozyme in 1923 and the world's first antibiotic substance benzylpenicillin (Penicillin G) from the mould Penicillium notatum in 1928, for which he shared the Nobel Prize in Physiology or Medicine in 1945 with Howard Florey and Ernst Boris Chain. He wrote many articles on bacteriology, immunology, and chemotherapy. Fleming was knighted for his scientific achievements in 1944. In 1999, he was named in Time magazine's list of the 100 Most Important People of the 20th century. In 2002, he was chosen in the BBC's television poll for determining the 100 Greatest Britons, and in 2009, he was also voted third "greatest Scot" in an opinion poll conducted by STV, behind only Robert Burns and William Wallace. Born on 6 August 1881 at Lochfield farm near Darvel, in Ayrshire, Scotland, Alexander was the third of four children of farmer Hugh Fleming (1816–1888) from his second marriage to Grace Stirling Morton (1848–1928), the daughter of a neighbouring farmer. Hugh Fleming had four surviving children from his first marriage. He was 59 at the time of his second marriage, and died when Alexander was seven. Fleming went to Loudoun Moor School and Darvel School, and earned a two-year scholarship to Kilmarnock Academy before moving to London, where he attended the Royal Polytechnic Institution. After working in a shipping office for four years, the twenty-year-old Alexander Fleming inherited some money from an uncle, John Fleming. His elder brother, Tom, was already a physician and suggested to him that he should follow the same career, and so in 1903, the younger Alexander enrolled at St Mary's Hospital Medical School in Paddington; he qualified with an MBBS degree from the school with distinction in 1906. Fleming had been a private in the London Scottish Regiment of the Volunteer Force since 1900, and had been a member of the rifle club at the medical school. The captain of the club, wishing to retain Fleming in the team, suggested that he join the research department at St Mary's, where he became assistant bacteriologist to Sir Almroth Wright, a pioneer in vaccine therapy and immunology. In 1908, he gained a BSc degree with Gold Medal in Bacteriology, and became a lecturer at St Mary's until 1914. Fleming served throughout World War I as a captain in the Royal Army Medical Corps, and was Mentioned in Dispatches. He and many of his colleagues worked in battlefield hospitals at the Western Front in France. In 1918 he returned to St Mary's Hospital, where he was elected Professor of Bacteriology of the University of London in 1928. In 1951 he was elected the Rector of the University of Edinburgh for a term of three years. During World War I, Fleming witnessed the death of many soldiers from sepsis resulting from infected wounds. Antiseptics, which were used at the time to treat infected wounds, often worsened the injuries. In an article he submitted for the medical journal The Lancet during World War I, Fleming described an ingenious experiment, which he was able to conduct as a result of his own glass blowing skills, in which he explained why antiseptics were killing more soldiers than infection itself during World War I. Antiseptics worked well on the surface, but deep wounds tended to shelter anaerobic bacteria from the antiseptic agent, and antiseptics seemed to remove beneficial agents produced that protected the patients in these cases at least as well as they removed bacteria, and did nothing to remove the bacteria that were out of reach. Sir Almroth Wright strongly supported Fleming's findings, but despite this, most army physicians over the course of the war continued to use antiseptics even in cases where this worsened the condition of the patients. At St Mary's Hospital Fleming continued his investigations into antibacterial substances. Testing the nasal secretions from a patient with a heavy cold, he found that nasal mucus had an inhibitory effect on bacterial growth. This was the first recorded discovery of lysozyme, an enzyme present in many secretions including tears, saliva, skin, hair and nails as well as mucus. Although he was able to obtain larger amounts of lysozyme from egg whites, the enzyme was only effective against small counts of harmless bacteria, and therefore had little therapeutic potential. 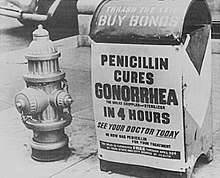 An advertisement advertising penicillin's "miracle cure". One sometimes finds, what one is not looking for. When I woke up just after dawn on September 28, 1928, I certainly didn't plan to revolutionize all medicine by discovering the world's first antibiotic, or bacteria killer. But I suppose that was exactly what I did. By 1927, Fleming had been investigating the properties of staphylococci. He was already well known from his earlier work, and had developed a reputation as a brilliant researcher, but his laboratory was often untidy. On 3 September 1928, Fleming returned to his laboratory having spent August on holiday with his family. Before leaving, he had stacked all his cultures of staphylococci on a bench in a corner of his laboratory. On returning, Fleming noticed that one culture was contaminated with a fungus, and that the colonies of staphylococci immediately surrounding the fungus had been destroyed, whereas other staphylococci colonies farther away were normal, famously remarking "That's funny". Fleming showed the contaminated culture to his former assistant Merlin Price, who reminded him, "That's how you discovered lysozyme." 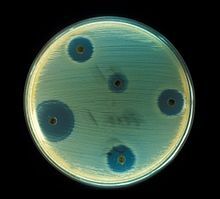 Fleming grew the mould in a pure culture and found that it produced a substance that killed a number of disease-causing bacteria. He identified the mould as being from the genus Penicillium, and, after some months of calling it "mould juice", named the substance it released penicillin on 7 March 1929. The laboratory in which Fleming discovered and tested penicillin is preserved as the Alexander Fleming Laboratory Museum in St. Mary's Hospital, Paddington. He investigated its positive anti-bacterial effect on many organisms, and noticed that it affected bacteria such as staphylococci and many other Gram-positive pathogens that cause scarlet fever, pneumonia, meningitis and diphtheria, but not typhoid fever or paratyphoid fever, which are caused by Gram-negative bacteria, for which he was seeking a cure at the time. It also affected Neisseria gonorrhoeae, which causes gonorrhoea, although this bacterium is Gram-negative. Fleming published his discovery in 1929, in the British Journal of Experimental Pathology, but little attention was paid to his article. Fleming continued his investigations, but found that cultivating Penicillium was quite difficult, and that after having grown the mould, it was even more difficult to isolate the antibiotic agent. Fleming's impression was that because of the problem of producing it in quantity, and because its action appeared to be rather slow, penicillin would not be important in treating infection. Fleming also became convinced that penicillin would not last long enough in the human body (in vivo) to kill bacteria effectively. Many clinical tests were inconclusive, probably because it had been used as a surface antiseptic. In the 1930s, Fleming's trials occasionally showed more promise, but Fleming largely abandoned penicillin work, leaving Howard Florey and Ernst Boris Chain at the Radcliffe Infirmary in Oxford to take up research to mass-produce it, with funds from the U.S. and British governments. They started mass production after the bombing of Pearl Harbor. By D-Day in 1944, enough penicillin had been produced to treat all the wounded in the Allied forces. In Oxford, Ernst Boris Chain and Edward Abraham were studying the molecular structure of the antibiotic. Abraham was the first to propose the correct structure of penicillin. Shortly after the team published its first results in 1940, Fleming telephoned Howard Florey, Chain's head of department, to say that he would be visiting within the next few days. When Chain heard that Fleming was coming, he remarked "Good God! I thought he was dead." Norman Heatley suggested transferring the active ingredient of penicillin back into water by changing its acidity. This produced enough of the drug to begin testing on animals. There were many more people involved in the Oxford team, and at one point the entire Dunn School was involved in its production. Fleming was modest about his part in the development of penicillin, describing his fame as the "Fleming Myth" and he praised Florey and Chain for transforming the laboratory curiosity into a practical drug. Fleming was the first to discover the properties of the active substance, giving him the privilege of naming it: penicillin. He also kept, grew, and distributed the original mould for twelve years, and continued until 1940 to try to get help from any chemist who had enough skill to make penicillin. But Sir Henry Harris said in 1998: "Without Fleming, no Chain; without Chain, no Florey; without Florey, no Heatley; without Heatley, no penicillin." Modern antibiotics are tested using a method similar to Fleming's discovery. Fleming's accidental discovery and isolation of penicillin in September 1928 marks the start of modern antibiotics. Before that, several scientists had published or pointed out that mould or Penicillium sp. were able to inhibit bacterial growth, and even to cure bacterial infections in animals. Ernest Duchesne in 1897 in his thesis "Contribution to the study of vital competition in micro-organisms: antagonism between moulds and microbes", or also Clodomiro Picado Twight whose work at the Institut Pasteur in 1923 on the inhibiting action of fungi of the Penicillin sp. genre in the growth of staphylococci drew little interest from the directors of the Institut at the time. Fleming was the first to push these studies further by isolating the penicillin, and by being motivated enough to promote his discovery at a larger scale. Fleming also discovered very early that bacteria developed antibiotic resistance whenever too little penicillin was used or when it was used for too short a period. Almroth Wright had predicted antibiotic resistance even before it was noticed during experiments. Fleming cautioned about the use of penicillin in his many speeches around the world. On 26 June 1945, he made the following cautionary statements: "the microbes are educated to resist penicillin and a host of penicillin-fast organisms is bred out ... In such cases the thoughtless person playing with penicillin is morally responsible for the death of the man who finally succumbs to infection with the penicillin-resistant organism. I hope this evil can be averted." He cautioned not to use penicillin unless there was a properly diagnosed reason for it to be used, and that if it were used, never to use too little, or for too short a period, since these are the circumstances under which bacterial resistance to antibiotics develops. The popular story of Winston Churchill's father paying for Fleming's education after Fleming's father saved young Winston from death is false. According to the biography, Penicillin Man: Alexander Fleming and the Antibiotic Revolution by Kevin Brown, Alexander Fleming, in a letter to his friend and colleague Andre Gratia, described this as "A wondrous fable." Nor did he save Winston Churchill himself during World War II. Churchill was saved by Lord Moran, using sulphonamides, since he had no experience with penicillin, when Churchill fell ill in Carthage in Tunisia in 1943. The Daily Telegraph and The Morning Post on 21 December 1943 wrote that he had been saved by penicillin. He was saved by the new sulphonamide drug Sulphapyridine, known at the time under the research code M&B 693, discovered and produced by May & Baker Ltd, Dagenham, Essex – a subsidiary of the French group Rhône-Poulenc. In a subsequent radio broadcast, Churchill referred to the new drug as "This admirable M&B". It is highly probable that the correct information about the sulphonamide did not reach the newspapers because, since the original sulphonamide antibacterial, Prontosil, had been a discovery by the German laboratory Bayer, and as Britain was at war with Germany at the time, it was thought better to raise British morale by associating Churchill's cure with a British discovery, penicillin. Display of Fleming's awards, including his Nobel Prize. Also shows a sample of penicillin and an example of an early apparatus for preparing it. Barcelona to Sir Alexander Fleming (1956), by Catalan sculptor Josep Manuel Benedicto. Barcelona: jardins del Doctor Fleming. Fleming's discovery of penicillin changed the world of modern medicine by introducing the age of useful antibiotics; penicillin has saved, and is still saving, millions of people around the world. The laboratory at St Mary's Hospital where Fleming discovered penicillin is home to the Fleming Museum, a popular London attraction. His alma mater, St Mary's Hospital Medical School, merged with Imperial College London in 1988. The Sir Alexander Fleming Building on the South Kensington campus was opened in 1998, where his son Robert and his great granddaughter Claire were presented to the Queen; it is now one of the main preclinical teaching sites of the Imperial College School of Medicine. His other alma mater, the Royal Polytechnic Institution (now the University of Westminster) has named one of its student halls of residence Alexander Fleming House, which is near to Old Street. Fleming, Florey and Chain jointly received the Nobel Prize in Medicine in 1945. According to the rules of the Nobel committee a maximum of three people may share the prize. 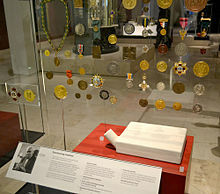 Fleming's Nobel Prize medal was acquired by the National Museums of Scotland in 1989 and is on display after the museum re-opened in 2011. Fleming was a member of the Pontifical Academy of Sciences. Fleming was elected a Fellow of the Royal Society (FRS) in 1943. Fleming was awarded the Hunterian Professorship by the Royal College of Surgeons of England. Fleming was knighted, as a Knight Bachelor, by king George VI in 1944. He was made a Knight Grand Cross of the Order of Alfonso X the Wise in 1948. It was a discovery that would change the course of history. The active ingredient in that mould, which Fleming named penicillin, turned out to be an infection-fighting agent of enormous potency. When it was finally recognized for what it was, the most efficacious life-saving drug in the world, penicillin would alter forever the treatment of bacterial infections. By the middle of the century, Fleming's discovery had spawned a huge pharmaceutical industry, churning out synthetic penicillins that would conquer some of mankind's most ancient scourges, including syphilis, gangrene and tuberculosis. The importance of his work was recognized by the placement of an International Historic Chemical Landmark plaque at the Alexander Fleming Laboratory Museum in London on November 19, 1999. When 2000 was approaching, at least three large Swedish magazines ranked penicillin as the most important discovery of the millennium. In 2002, Fleming was named in the BBC's list of the 100 Greatest Britons following a nationwide vote. A statue of Alexander Fleming stands outside the main bullring in Madrid, Plaza de Toros de Las Ventas. It was erected by subscription from grateful matadors, as penicillin greatly reduced the number of deaths in the bullring. Flemingovo náměstí is a square named after Fleming in the university area of the Dejvice community in Prague. A secondary school is named after him in Sofia, Bulgaria. In Athens, a small square in the downtown district of Votanikos is named after Fleming and bears his bust. There are also a number of Streets in greater Athens and other towns in Greece named after either Fleming or his Greek second wife Amalia. In mid-2009, Fleming was commemorated on a new series of banknotes issued by the Clydesdale Bank; his image appears on the new issue of £5 notes. In 2009, Fleming was voted third greatest Scot in an opinion poll conducted by STV, behind only Scotland's national poet Robert Burns and national hero William Wallace. 91006 Fleming, an asteroid in the Asteroid Belt, is named after Fleming. Fleming station, on the Thessaloniki Metro system, takes its name from Fleming Street on which it is located, which in term is named after him. On 24 December 1915, Fleming married a trained nurse, Sarah Marion McElroy of Killala, County Mayo, Ireland. Their only child, Robert Fleming (1924–2015), became a general medical practitioner. After his first wife's death in 1949, Fleming married Dr. Amalia Koutsouri-Vourekas, a Greek colleague at St. Mary's, on 9 April 1953; she died in 1986. From 1921 until his death in 1955, Fleming owned a country home in Barton Mills, Suffolk. On 11 March 1955, Fleming died at his home in London of a heart attack. He is buried in St Paul's Cathedral. ^ a b c Colebrook, L. (1956). 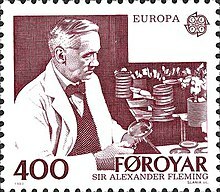 "Alexander Fleming 1881-1955". Biographical Memoirs of Fellows of the Royal Society. 2: 117–126. doi:10.1098/rsbm.1956.0008. JSTOR 769479. ^ a b "Sir Alexander Fleming – Biography". Nobel Foundation. Retrieved 25 October 2011. ^ a b c "Alexander Fleming Biography". Les Prix Nobel. The Nobel Foundation. 1945. Retrieved 27 March 2011. ^ Hugh, TB (2002). "Howard Florey, Alexander Fleming and the fairy tale of penicillin". The Medical Journal of Australia. 177 (1): 52–53, author 53 53. PMID 12436980. ^ Cruickshank, Robert (1955). "Sir Alexander Fleming, F.R.S". Nature. 175 (4459): 663. Bibcode:1955Natur.175..663C. doi:10.1038/175663a0. ^ McIntyre, N (2007). "Sir Alexander Fleming". Journal of Medical Biography. 15 (4): 234. doi:10.1258/j.jmb.2007.05-72. PMID 18615899. ^ a b c d Mazumdar, PM (1984). "Fleming as Bacteriologist: Alexander Fleming". Science. 225 (4667): 1140–1141. Bibcode:1984Sci...225.1140C. doi:10.1126/science.225.4667.1140. PMID 17782415. ^ Brown, Kevin (2004). Penicillin man : Alexander Fleming and the antibiotic revolution. Stroud: Sutton. ISBN 978-0750931526. Retrieved 11 September 2015. ^ a b Tan, SY; Tatsumura, Y (July 2015). "Alexander Fleming (1881–1955): Discoverer of penicillin". Singapore Medical Journal. 56 (07): 366–367. doi:10.11622/smedj.2015105. PMC 4520913. PMID 26243971. ^ FLEMING, ALEXANDER (September 1917). "THE PHYSIOLOGICAL AND ANTISEPTIC ACTION OF FLAVINE (WITH SOME OBSERVATIONS ON THE TESTING OF ANTISEPTICS)". The Lancet. 190 (4905): 341–345. doi:10.1016/S0140-6736(01)52126-1. ^ Fleming, A (1922). "On a remarkable bacteriolytic element found in tissues and secretions". Proceedings of the Royal Society B. 93 (653): 306–317. doi:10.1098/rspb.1922.0023. ^ Haven, Kendall F. (1994). Marvels of Science : 50 Fascinating 5-Minute Reads. Littleton, Colo: Libraries Unlimited. p. 182. ISBN 1-56308-159-8. ^ Brown, K. (2004). Penicillin Man: Alexander Fleming and the Antibiotic Revolution. 320 pp. Sutton Publishing. ISBN 0-7509-3152-3. ^ Fleming, A (1980). "On the antibacterial action of cultures of a penicillium, with special reference to their use in the isolation of B. influenzae. (Reprinted from the British Journal of Experimental Pathology 10:226–236, 1929)". Clin Infect Dis. 2 (1): 129–39. doi:10.1093/clinids/2.1.129. PMC 2566493. PMID 6994200. ; Reprint of "On the Antibacterial Action of Cultures of a Penicillium, with Special Reference to their Use in the Isolation of B. influenzæ". Br J Exp Pathol. 10 (3): 226–236. 929. PMC 2048009. ^ Rossiter, Peter (10 September 2010). "Keith Bernard Rogers". BMJ. 331 (7516): 579. doi:10.1136/bmj.331.7516.579-c. PMC 1200632. Keith was probably the first patient to be treated clinically with the mould juice. ^ in October 1943 Abraham proposed a molecular structure which included a cyclic formation containing three carbon atoms and one nitrogen atom, the β-lactam ring, not then known in natural products. This structure was not immediately published due to the restrictions of wartime secrecy, and was initially strongly disputed, by Sir Robert Robinson among others, but it was finally confirmed in 1945 by Dorothy Crowfoot Hodgkin using X-ray analysis." Oxford Dictionary of National Biography; "Abraham, Sir Edward Penley"
^ Lowe, Gordon (13 May 1999). "Obituary: Sir Edward Abraham". The Independent. London. ^ A History of May & Baker 1834–1984, Alden Press 1984. ^ Roberts, Michael; Ingram, Neil (2001). Biology (2, illustrated ed.). Nelson Thornes. p. 105. ISBN 0-7487-6238-8. Retrieved 4 March 2012. Penicillin is just one of a very large number of drugs which today are used by doctors to treat people with diseases. ^ "100,000 visitors in 6 days". National Museums Scotland. 3 August 2011. Archived from the original on 23 February 2012. Retrieved 4 March 2012. ^ "No. 36544". The London Gazette (Supplement). 2 June 1944. p. 2566. ^ "Alexander Fleming – Time 100 People of the Century". Time. 29 March 1999. ^ "Banknote designs mark Homecoming". BBC News. 14 January 2008. Archived from the original on 25 January 2009. Retrieved 20 January 2009. ^ "Robert Burns voted Greatest Scot". STV Group. 30 November 2009. Retrieved 7 February 2016. ^ BartonMills.net local history. Retrieved 17 October 2016.